Tis’ the Season for Giving… and Receiving! This time of year, I get to enjoy two days of opening presents. With my birthday being on the same week as Christmas Day, if I’m lucky, I tend to end up with plenty new model kits and books. Time for a quick overview of some of the military related gifts that I’ve received this year. Firstly, following on from the very pleasing painting of Strelets French Army Sledge Train figures earlier this month, at my suggestion for a birthday present I’ve been kindly supplied with set 2 of this series. It will probably be December 2019 before I even think of getting to work on them, however. I’ve also come into ownership of two boxes of RedBox’s Ottoman (or Osman) infantry: namely the elite Yeniceri (Janissaries) and Eyalet troops. They are really great quality figures for sure and I’m now committed to developing Ottomania – my Ottoman Turkish army project. Apropos of this, my father-in-law was visiting a military bookshop in Birmingham recently and asked if there was anything I’d like for Christmas whilst he was there. I mentioned a book on Ottoman armies by the peerless Osprey to further assist my Ottomania project and it seems he took the idea and ran with it! Christa Hook’s illustration of 16thC Ottoman Janissaries. A bit more reading material – something that I’ve wanted for a while is the now well-out-of-print book by R.G. Harris on “50 Years of Yeomanry Uniforms: Volume 1”. Harris was one of the contributors to some of the books in the essential Ogilby Trust “Uniforms of the British Yeomanry Force” series in the late 80s / early 90s. This 1972 edition has that evocative musty smell of old bookshops and features 32 terrific full page and full-colour illustrations by Edward A Campbell. I was interested to read in the preface that Campbell was responsible for the artwork in the 1931 Players cigarette card series Military Headdress, which I am well familiar with from my own collection. Campbell’s illustration of an officer of the Norfolk Yeomanry (see also my post on the Norfolk and Suffolk Yeomanry collection). Campbell’s paintings were based on ‘painstaking research’ of which most apparently is sadly unpublished. Even more tragically, the preface informs me that “the author of the text is preparing a second volume on the Yeomanry which will incorporate a further selection of Captain Campbell’s work…”, yet I can find no evidence that Volume 2 was ever published. Uniform of the Northamptonshire Yeomanry, an example of which I saw earlier this year in Northampton. Officer of the Shropshire Yeomanry, another uniform that I saw earlier this year during my trip to Shrewsbury. With my Cracker Battery of the Christmas Artillery taking a turn on the mantelpiece for the Christmas period, my 12-year old daughter wondered if she could take some photos. Recently she has been undertaking a photography course and, in my unbiased opinion, has a real aptitude for it. Noticing my fake snow jar, she asked if she could create some winter scenes with it using my figures. She had not previously photographed my figures before and I just let her snap away using a 2nd-hand free camera she is using. It’s just a bargain basement instamatic type thing but the results were really interesting. I told her to take as many she liked and I’d make up a Christmas story from the output, putting these random scenes together. The result was this overlong piece of doggeral I’ve entitled “A Miracle in Advent”. It wasn’t meant to be ‘published’ on the blog, being just a random piece of fun to make use of her images. I also threw in a few of my own where the story needed it. Nonetheless, featuring some of my figures as it does, here it is – for posterity if nothing else. Presenting “A Miracle in Advent” – be warned – it’s five minutes of dreadful rhymes. On a snowy December’s night, Colonel de Winter rides his trusty horse ‘Tinsel’ through the streets of the small town of Advent. He is returning to his lodging at the Manor House. Indeed, all the men of his regiment, the 1st Noel Foot Guards, are billeted in the town for the Christmas season. As stated in my previous post, I’ve retrieved my Christmas Infantry Brigade from storage. 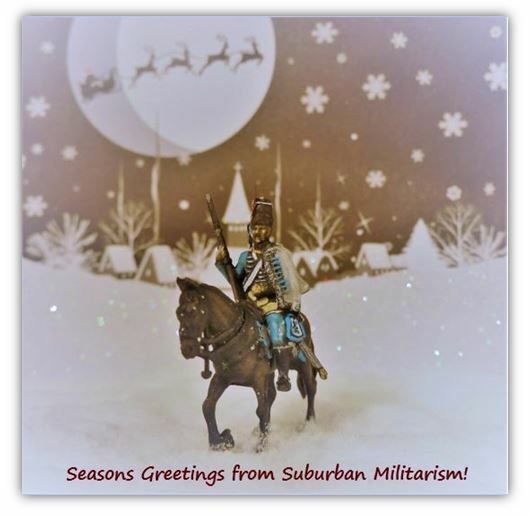 Two regiments take turns to parade on the mantelpiece over the Christmas period. Whilst for this year it is the turn of the 1st Noel Regiment of Foot Guards, I’ve been busy painting a half-dozen figures to add to my under-strength Yule Grenadiers. Using, Revell’s increasingly rare “Seven Years War Austrian Infantry” set, this year I’ve added a drummer, five marching grenadiers and am just finishing off a mounted officer. The Yule Grenadiers are now 17 strong. The flags of both regiments was designed by my young daughter on computer. The 1st Noel have a nice red flag with lots of baubles, the Yule Grenadiers have a flag featuring a Christmas pudding on a green background! For this Christmas, my daughter has received an innovative advent calendar which builds daily into a snow-covered town using pressed out card for houses and trees. I thought this might prove to be a nice backdrop for parading both regiments (scale notwithstanding) and she kindly let me borrow it for these photographs. On a snowy December day, the Yule Grenadiers take up their right to march through the streets of Advent, the regiment enjoy the honour of having the ‘freedom on the town’. An NCO and musketeer of the 1st Noel Regiment of Foot, pieces of tinsel in their tricorns. Great news those with access to British television, the very wonderful Time Commanders returns after an absence of about a decade. The series features hour-long episodes dedicated to wargaming battles from ancient history. Episode one will feature the Roman-Cathaginian battle of Zama, 202BC. Previous episodes included such battles as Cannae, Gauagamela, Chalons-sur-Marne, Tuetoburg Forest, Qadesh and Stamford Bridge. It’s all done using virtual figures rather than painted versions, but makes for great television nevertheless! Best wishes for the season to everybody!